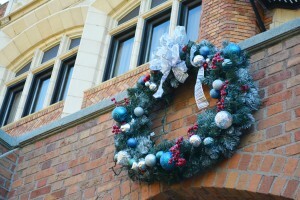 With Christmas only a week away, the holiday spirit has swept through Loyola. 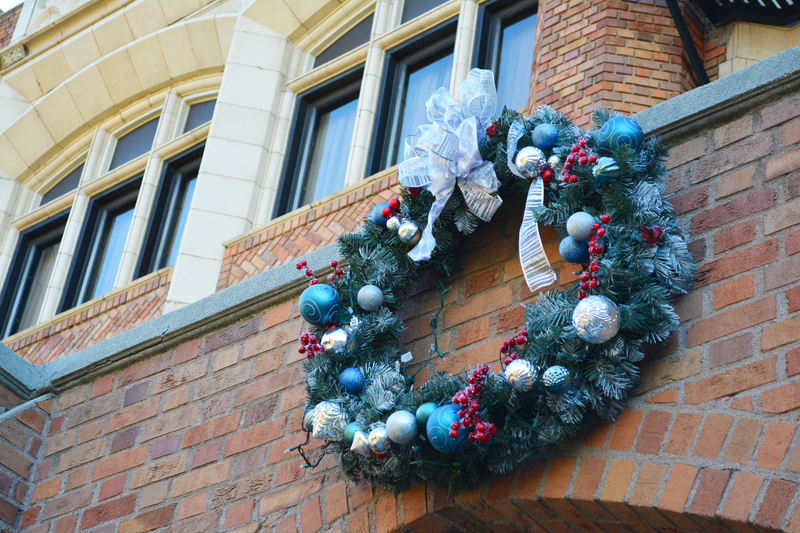 All around campus, the excitement and anticipation of the holiday season is evident through Christmas-themed events, activities and decorative projects. Many teachers and staff members have worked to decorate their classrooms. Two such teachers are mathematics teacher Mr. Matthew Baham and theology teacher Mr. Thomas Cendejas. Mr. Baham’s L104 has been garnished with a multitude of Christmas decorations, ranging from festive wrapping paper to hundreds of lights to even a full-sized Christmas tree. “I enjoy Christmas, I love Christmas a lot. I enjoy the celebration of Jesus, and to me it means a lot. It [his passion for decorating]started with my older brother creating a life-sized nativity scene out of paper mache, and from there it spawned into our house being decorated completely, inside and out,” Mr. Baham said. In addition to Mr. Baham, Mr. Cendejas has also decorated his classroom. 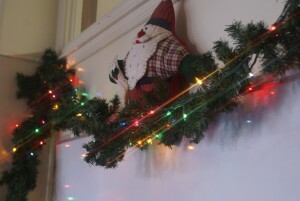 On Dec. 2 and 3, he and several student volunteers adorned room B204 with various decorations, including tinsel, snowflakes, lights and wrapping paper. To help Mr. Cendejas decorate his room, interested students were required to submit custom applications on Canvas; specifically, students needed to state their prior experience and skill in the field of Christmas decorating. Mr. Cendejas, however, said his focus was not on the Christmas celebration itself but rather on the season of Advent: “I definitely want my students to focus on Advent first because that is the season that we’re in, but part of Advent is preparing for Christmas, so I want to do that visually by creating an environment in my classroom that’s going to be a real celebration of Christmas,” he said. In addition to classrooms and the library, many offices throughout campus were also embellished with various themed decorative pieces. Members of the counseling office posted fireplace-themed artwork to administrative assistant Mrs. Melinda Wiggins’ desk; similarly, the main office was filled with gingerbread, tinsel, lights and a christmas tree. “So each year we have Christmas trees, and we usually inherit them from the dance, so a lot of the offices go in and get a tree after the dance; the maintenance guys are really nice and bring them to us…,” Ms. Rosie Morales-Penuela, administrative assistant, said. The Student Center also received a Christmas tree from the dance, and like many other departments, it too has embraced the season. “Sometimes we make our own decorations, and sometimes we use the ones we have stored in the closet…. We’re going to start serving peppermint candy and Christmas candy, and we’re just going to get the feel of the holiday season for the next two weeks…. ” administrative assistant Mrs. Salvaty said. 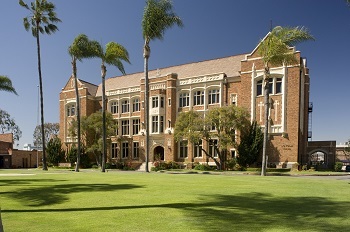 The exteriors of several buildings have been furnished with various baubles, ranging from two wreaths on the east and west ends of Loyola Hall to red poinsettias lining the entry of Rupert. The Christmas celebration is not confined to only decorations, however. 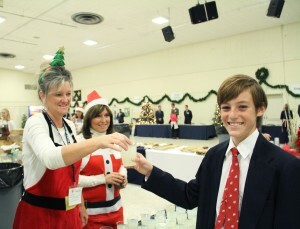 Many Christmas-themed events, including club activities and school-wide gatherings, were celebrated throughout December. The True Gentleman’s Club hosted a Christmas-themed meeting on Dec. 3rd. During the meeting, members were introduced to multiple do-it-yourself Christmas gifts and learned how to roast chestnuts on an open fire. The Top Chef Club also celebrated Christmas, according to Mr. Cendejas. “ We plan on having a Christmas bake-off competition where people can make cookies, breads, etc…,” according to club moderator Mr. Cendejas. The faculty and staff also had celebrations of their own. Ms. Morales organized for faculty and staff members to wear santa hats on Dec. 4 and christmas sweaters on Dec. 11. In addition, several faculty members participated in a secret santa. 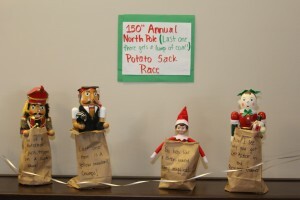 School-wide events were also widely celebrated during the month of December. The Christmas choir concert and mass of the Feast of the Solemnity of the Immaculate Conception were also celebrated last week. The Mass of the Feast of the Solemnity of the Immaculate Conception was held on Tuesday, Dec. 8, and the mass was complemented by a hopeful-themed homily by the Rev. Stephen Barber, S.J. Many students found the homily a resonating aspect of the mass. “I thought it [the homily]was very inspiring, and it helped to make people feel and strive to be a light in the community and to help to make society a better place by trying to enact Jesus and reflect Jesus in our actions every day,” sophomore Alex Behney said. The Loyola Choir, led by music teacher Mr. Steven Speciale, participated in two Christmas concerts–the Lessons and Carols celebration on Dec. 5 as well as the school-wide Christmas concert on Dec. 9. Mr. Speciale said that the choir’s goal is more than just singing. “It [The choir experience] is really about being a servant. What we do in choir is we serve the art and we serve others through art. It’s really not about anyone in particular; it’s about what we give,” he said.